Royal Langnickel Seven Piece Deluxe Beginner Brush Set with Plastic Palette- An excellent value for beginners and professionals alike. This set comes with seven flat Golden Taklon (nylon) hair brushes. Brushes included are Rounds #6/0, 0, & 5; Flats #2 & #8; Wash #3/4"; and a Rigger #2. 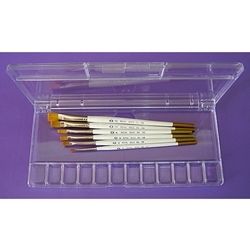 The whole set is packed inside of the clear plastic palette, which doubles as a carrying case.